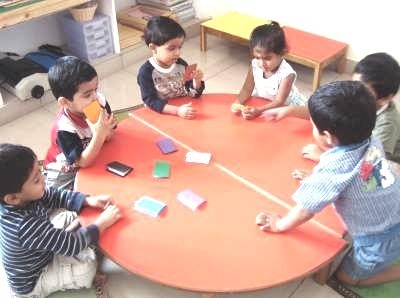 There is no specific academic year at Montessori because the children join us when they are between 2-3 yrs of age and will leave at about 6 yrs of age. We do take older children from other Montessori environments on transfers. Admission Criteria:For our convenience we have segregated the age groups as follows. Lower Montessori --- 2 – 31/2 yrs. Middle Montessori --- 31/2 --- 4 ½ yrs. Senior Montessori --- 4 ½ --- 6 yrs. 9:00 a.m. to 2:30 p.m. --- above 3 ½ yrs. Fees have to be paid for six months together twice a year, once at the time of admission and the next in the first week of the second term of the academic year. After the due date fine of 50/- will be collected for each day. Once the child is withdrawn, re-admission can be made only on a fresh basis. Transfer certificate will be issued after the completion of the course and the payment of arrears if any.